When it comes to baby gear, there have been advancements in the years since my girls were infants... some better than others. From some brands, there are new styles and designs of their products. A new, brightly-colored fabric of bouncy seat, the addition of a cupholder on a stroller or maybe a diaper pocket on a play yard. Other companies, however, have arrived to the U.S. market and brought with them a collection of high quality, innovative, original products that are designed with the understanding of what parents want and need. Instead of items that are just another copy of whatever is already out there, they have their own original way of assessing the demands of parenthood and inventing something that is versatile, convenient and modern. Introducing Spain-based Babyhome and their award-winning line of fresh, functional and gorgeous baby gear. Recognized as a leader and pioneering company in the design of child care products, Babyhome was founded in 2005 and has been collecting awards and recognition ever since. Featuring a range of products that includes a stroller, cot, high chair, bouncer and bed barrier, each one demonstrates the cutting edge original designs that Babyhome is known for, while also conforming to the highest safety standards. 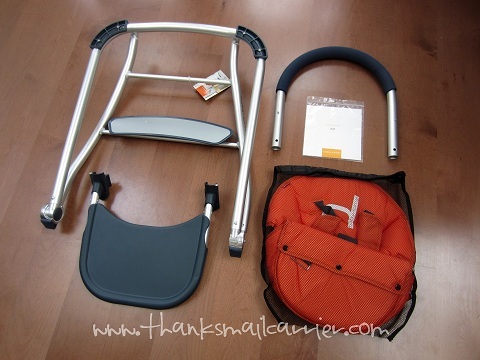 After having been thoroughly impressed with what I saw on Babyhome's website, I had high hopes that the Eat high chair would live up to (and most likely surpass) the expectations that I had for this company and their quality products. A compact, extremely lightweight, easy-to-care-for product, the Eat high chair takes the features of a great high chair and puts them into a single, modern, convenient package that is able to fit into all areas of your life, both literally and figuratively. As I began to pull it out of the box, there was a fleeting second where I wondered whether I needed to go get a screwdriver and check the clock to see if I would have enough time for assembly... but then I took a second look at the four main pieces and realized that there was hardly any work necessary to have this high chair ready for use. ...before it was time for the tray. 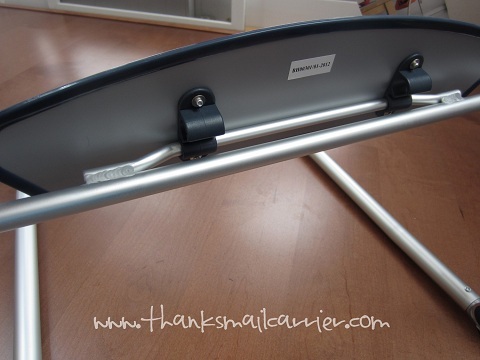 While I am used to the typical bulky high chair tray that is held in place by sliding it just so onto the arms of the frame, Babyhome's is extremely unique and simple. Along both sides of the high chair are two small indents that match up with two nobs on the tray itself. 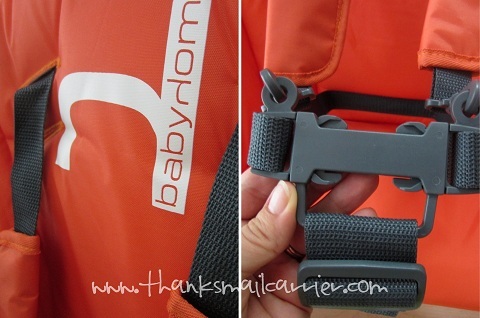 When the four connect, the clasps on the tray are able to snap securely into place! Considering how quickly this high chair came together, I could immediately see that pulling this out when it was time to eat would be quick and easy. While this high chair has a minimalistic appearance, Babyhome didn't skimp when it came to quality, convenience or safety — all of which are apparent just from a single glance. ...and the plush, quilted fabric seat is breathable, removable and washable. No worries about how you'll get that spilled milk out or if you'll have to scrub at a splatter of applesauce. 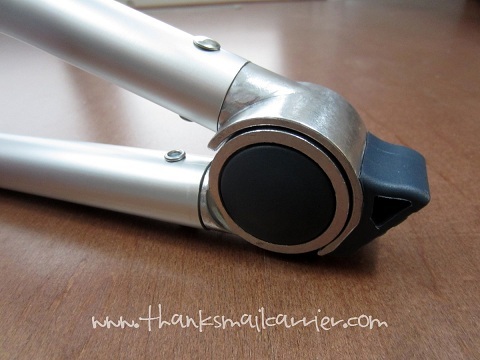 Simply unsnap the three snaps at the bottom of the seat, pull it off and into the washing machine it goes. 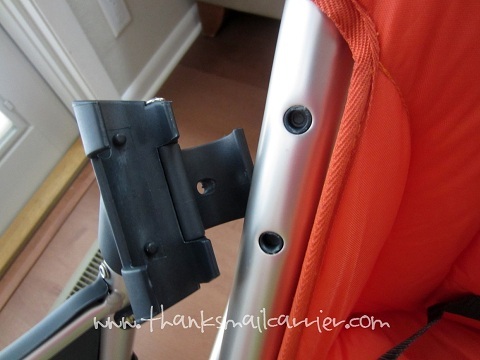 While the ability to clean this high chair easily is great, the aspect that I really love is the lightweight portability and just how compact the entire thing folds down. ...the frame collapses down to a height that is less than 5" high. How incredible is that! Instead of always having to have a high chair take up space in your kitchen or dining room, the Eat high chair can be slid in between cupboards, under a bed, or tucked into a closet without problem. 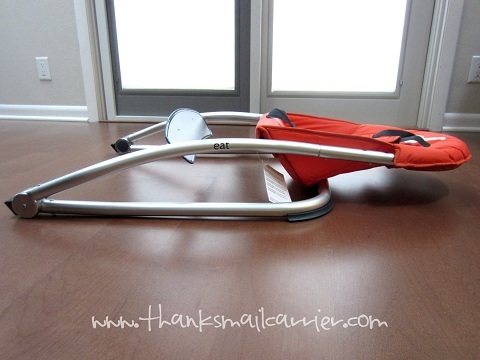 Whether you are a parent who would use this multiple times a day or a grandparent who wants to keep it on hand for when little ones come to visit, this folds and unfolds so quickly that you'll always be prepared. 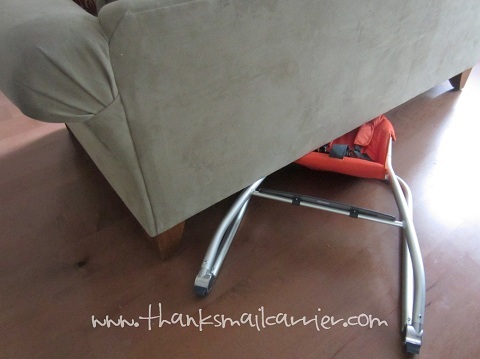 No worries if a neighbor shows up unexpectedly with their little one when I can just pull this high chair out from under the couch and pop it open! If a 5-year-old and a 3-year-old can work this high chair, you know that means that it is intuitive and simple. And it's no wonder that they can easily pick it up and walk away with it — it only weighs 7.5 pounds! ...you're set for years to come with this lightweight chair. There are even plastic guards on the bottom of the legs so that it doesn't scratch the floor when being pulled in and out. ...and all of the parents that have caught a glimpse of this high chair have responded very positively to the clean lines and uncluttered design of the Eat. There is no need for plastic or toys or massively large high chairs that take up half the room anymore! 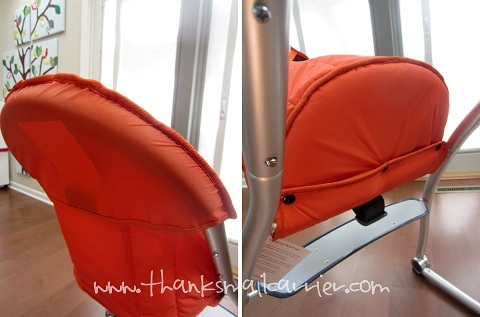 While we have noticed that this chair doesn't have the option of changing the height, reclining the seat or include a raised edge along the back of the tray — to keep babies from pulling the food towards themselves and down into their lap — I don't think that these features compare to all of the ways that Babyhome has made this an extremely great purchase. 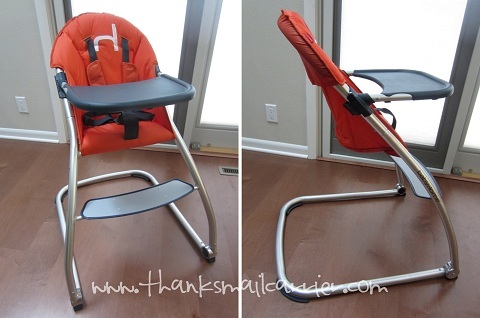 I would have gladly traded the high chair that we used when my girls were babies for this one! 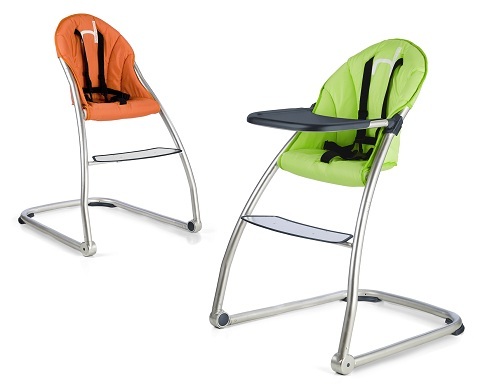 Retailing for $149, the Eat high chair can be purchased from Magic Beans and is available in other fun colors such as red, lime, purple, navy and more. Much more information about the Eat (as well as Babyhome's other great products) can be found on their website. You'll also want to connect with Babyhome on Twitter as well as on Facebook for news of special promotions, new product introductions and more. I love the simple and sleek design. And the vibrant fabric colors are really modern. Great review Xenia!! Look at that little messy face in there. She's cute! It's kinda neat that it folds down, but I probably would just leave it up cuz I'm lazy like that. The styling would fit nicely into a modern home. love it. wish I had that for my son. I love the modern look, very nice.